"This is one of the most sublime choral records I have ever heard." 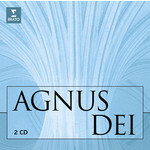 This richly varied collection of meditative sacred music takes its name, Agnus Dei, from the opening item, a setting for voices of Samuel Barber's celebrated and deeply expressive Adagio for Strings. The hauntingly melodic choral masterpieces that fill these two CDs span five centuries and are the work of composers such as Bach, Mozart, Allegri, Albinoni, Fauré, Rachmaninov, Mendelssohn, Brahms, Elgar and, from nearer our own time, John Tavener and Henryk Górecki. They are performed by the choir of New College Oxford, an exemplar of Britain's great choral tradition.